Depending on the circumstances which caused for your student to become blind, learning to find his way with a white cane is not as easy as you might think so why don't you give it a try to understand better your student's frustration. 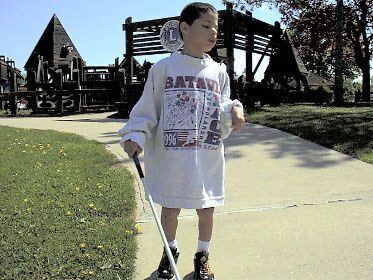 If a child has been affected by blindness since he was born or even too young to remember what it was like to be able to see, there has been so much practice that using a white cane for orientation purposes is like an extra sense and becomes a natural way to situate himself. The frustration level is lower and he will use it in ways that noone could ever think possible. What is a white cane used for? Find an obstacle on his path. Determine the distance between the person and the obstacle. Help the person to determine the shape of the obstacle. Help the person to evaluate the size of the obstacle. Allow the person to evaluate if the obstacle is moving or not. Evaluate if the obstacle is hard or soft. Determine if the obstacle is at the same level as their feet. Allow to determine what substances are on the ground. Help the person determine the depth of certain obstacles such as stairs. Give the person the opportunity to evaluate obstacles that are off the ground. Help the person to determine the width of the path. Identify the person using it as being blind so people avoid being in their path. For a person whose sight has been recentlty affected by blindness, the white cane is an evil tool that may be a reminder of their visual impairment as well as a source of frustration. It takes quite a while to someone to learn how to use it for their own benefit. Often, there are formative sessions that are available for this person. It is always a good idea for a relative or any person working with this student to experiment themselves with a white cane. This way, you will be more compassionate and understanding of the outbursts of frustration that your student might be going through. If he knows that you understand where his anger comes from, it may diminish his level of frustration. In any way, always remain helpful, patient and supportive. 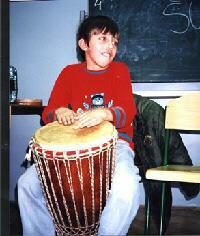 Music is a different way to express himself for a visually impaired child. Music is an exciting way for any child to express himself and that at any age. Through the use of music, you can study and learn about traditions, cultures, composers, instruments, dance and so much more. As any other child, teaching music to a visually impaired child is a gift as it allows him or her to express emotions, opinions and appreciation. When you teach music to a visually impaired child, you should keep the following tips in mind so the experience becomes a positive one instead of one affected by frustration. First, let him discover an instrument by touch. Second, let him discover the variety of sounds on their own. Third, let him discover a variety of instruments. Fourth, let him hear a variety of musical partitions with each of these instruments. Fifth, show him patiently how to position his hands or fingers on an instrument of his choice so he can produce specific notes. Sixth, when he is familiar with the notes, let him experiment with timing and rythmn by introducing them slowly, allowing him to learn and master them before going further. Seventh, if your student can visually read music with special resources, you can always use a software program on the computer to make the written music bigger or you may photocopy bigger partitions. Avoid coloured paper. If he is unable to read music even with special resources, use the sounds and practice time to allow him to learn the music. If you follow these steps, both your student and you will make music a rewarding experience.